The implication here being that young people simply can’t hear the greatness that is classical music. The music is simply too complex for their dumbed down ears. This sort of statement doesn’t seem to phase the classical audience that will likely be reading it but anyone who’s not already in that circle is probably going to feel, as I did, that this is a bit of a shot at those who listen to popular music. That is audio engineer, composer, and guitarist Josh McNeil's interesting riposte to recent posts from Will Robin and me about how classical music can connect with younger audiences. On Friday I caught a one-off dance performance by the corps de ballet in the Avignon opera house. It was a text book example of how to reach young audiences using music ranging from baroque through pop to techno combined with video images. But the sound, oh dear the sound. The recorded music for the production was played through two large and battered PA speakers either side of the stage and lacked fidelity, slam, dynamics and practically everything else. But the capacity audience, which was almost all youngsters with parents, loved it. Audiophile company Quad Electroacoustics' long standing strapline 'The closest approach to the original sound' positions the concert hall as the sonic reference point. So does music education for the iPod generation mean exposing young ears to the original sound? Or should we be accepting that for young people reproduced rather than live music is the original sound? Is it the classical music community that now has the prejudiced ears? Can we learn from Alan Watts writing about John Cage? What may not be generally understood about John [Cage} is that he is an extremely accomplished musician who has, however, realized that we do not know how to listen. Conventional music, as well as conventional speech, have given us prejudiced ears, so that we treat all utterances which do not follow their rules as static, or insignificant noise. There was a time when painters, and people in general, saw landscape as visual static - mere background. John is calling our attention to sonic landscape, or soundscape, which simultaneously involves a project for cleaning the ears of the musically educated public. 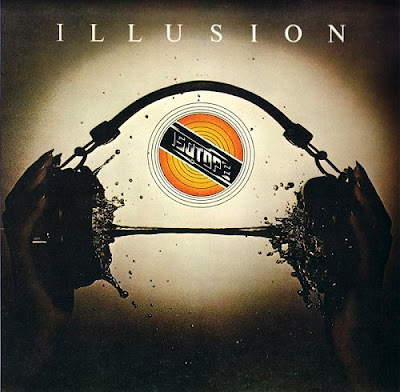 Header image is Illusion's 1974 album Isotope with artwork by Gull Graphics' inhouse designer John Pasche. Any copyrighted material on these pages is included as "fair use", for the purpose of study, review or critical analysis only, and will be removed at the request of copyright owner(s). Report broken links, missing images and errors to - overgrownpath at hotmail dot co dot uk Also on Facebook and Twitter.